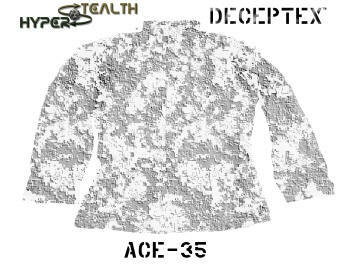 We have temporarily suspended the ordering from this page to allow us to complete our patents on the Quantum Stealth Light Bending Material. We will reinstate the ordering ability on this page after we have completed our patents. "Print on Order Camouflage" is available to the masses. May 1, 2012 (Vancouver, B.C.) 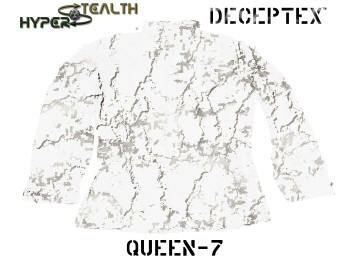 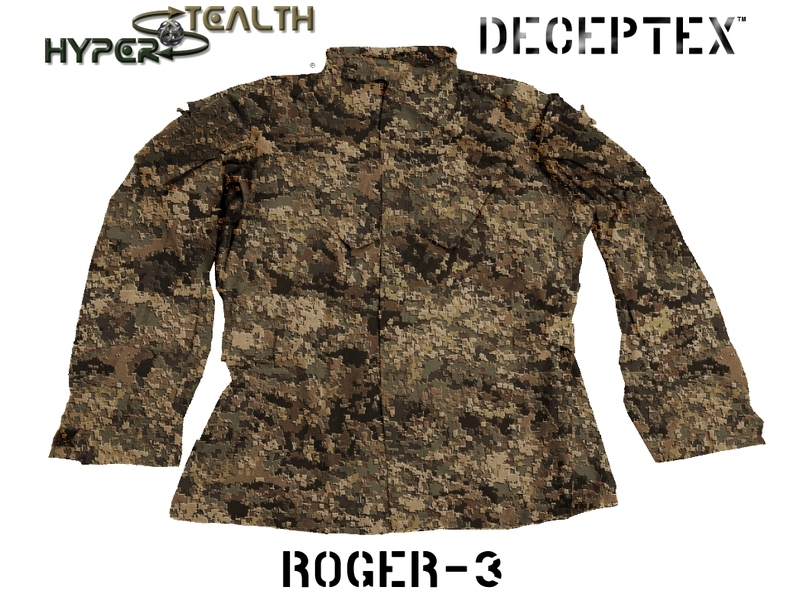 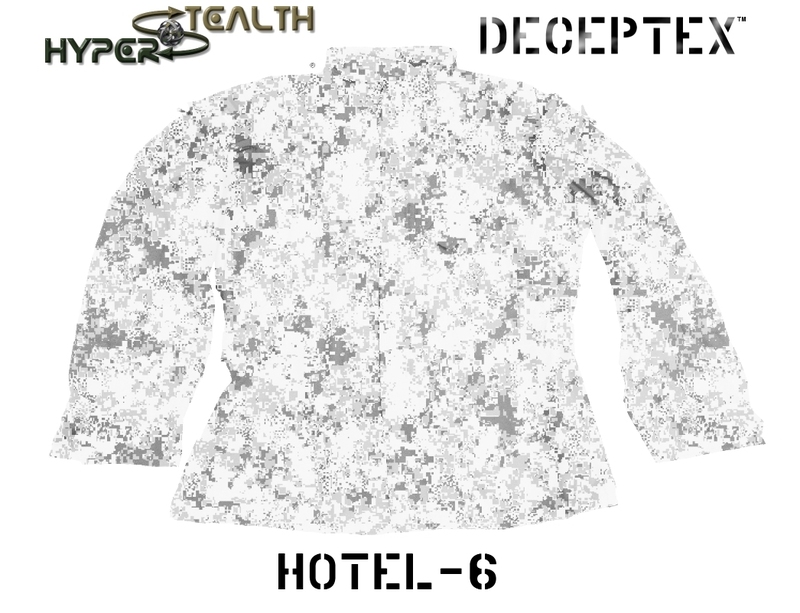 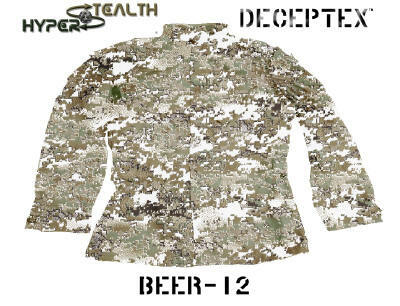 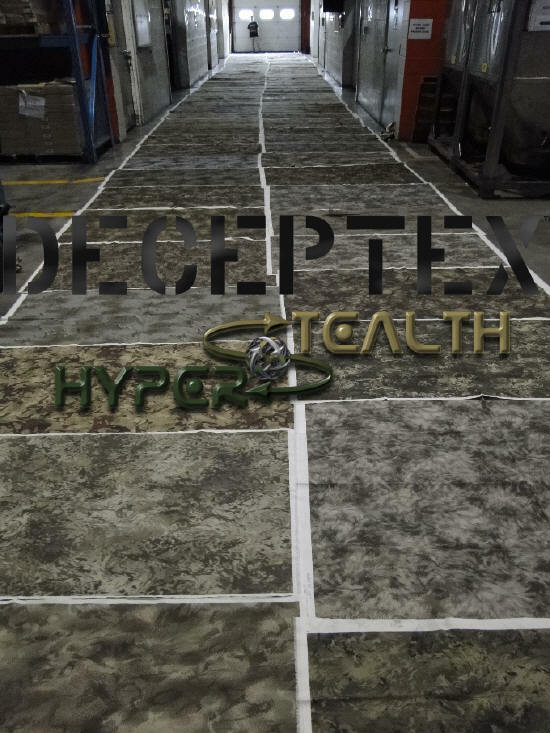 Hyperstealth Biotechnology Corp. announces DECEPTEX, an innovative "Print on Order" camouflage system capitalizing on 21st century technology. 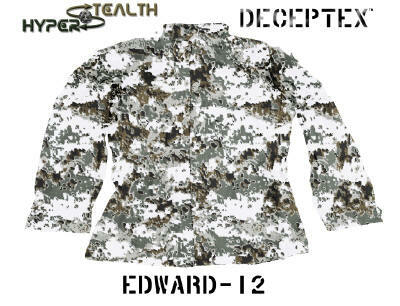 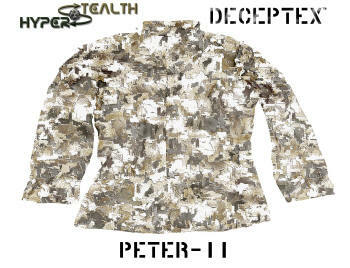 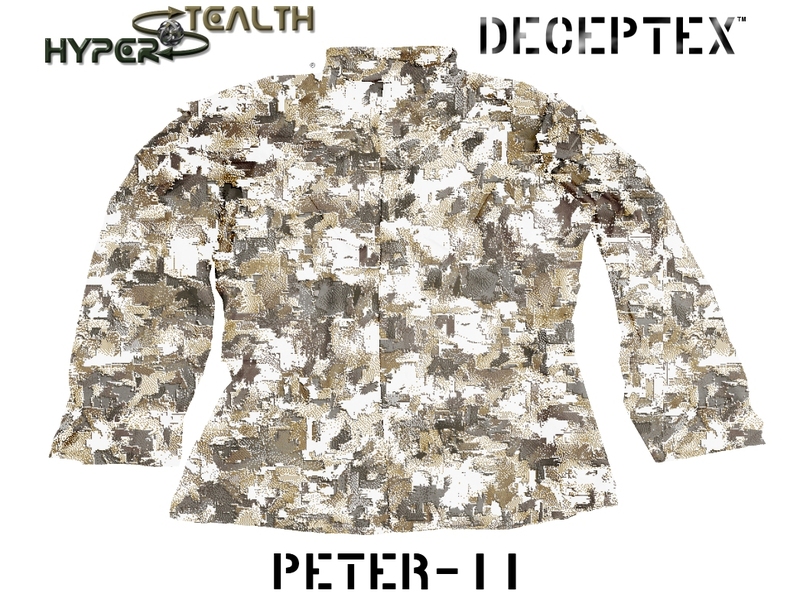 Deceptex is not a camouflage pattern but a camouflage system; Hyperstealth will use their two large format digital inkjet textile printers to print any Deceptex pattern as customer will be able to order one or more uniforms based on a selection of hundreds of Hyperstealth Camouflage patterns (see 580+ current Deceptex patterns at bottom of page) . In 1918 the Model-T was "available in any color as long as it was black". Jump ahead almost 100 years and due to a similar set of circumstances, camouflage is available in a limited pattern selection. Deceptex was developed by Hyperstealth's President/CEO, Guy Cramer, over the past 2 years based on lessons learned from the Ghostex system he developed with ADS Inc. for U.S. Special Forces. Prior to Ghostex, orders of a particular color scheme in one pattern would require 10,000 yard print minimums. Ghostex changed the way special forces selected camouflage allowing them to place orders for very short runs of a few yards with very specific camouflage patterns. Last year, Hyperstealth brought in a large inventory of completed Spec4ce uniforms, using the traditional ordering method (Large textile printing factory and large production assembly factory to complete the uniforms) in 17 color schemes for commercial orders. 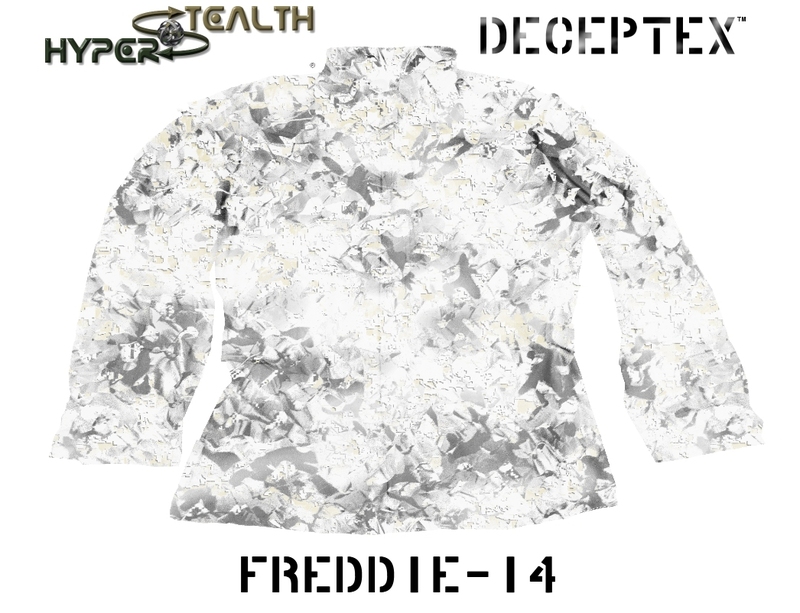 When there is a large inventory and numerous color schemes to choose from, things are good, however, when you begin to run low you must now consider another large purchase of inventory and you also need to have that inventory in a large accessible storage area. Between 15-20% of production ends up as "dead stock" where sizes don't match, which is difficult to sell as different sizes tops do not match the sizes in the bottoms. 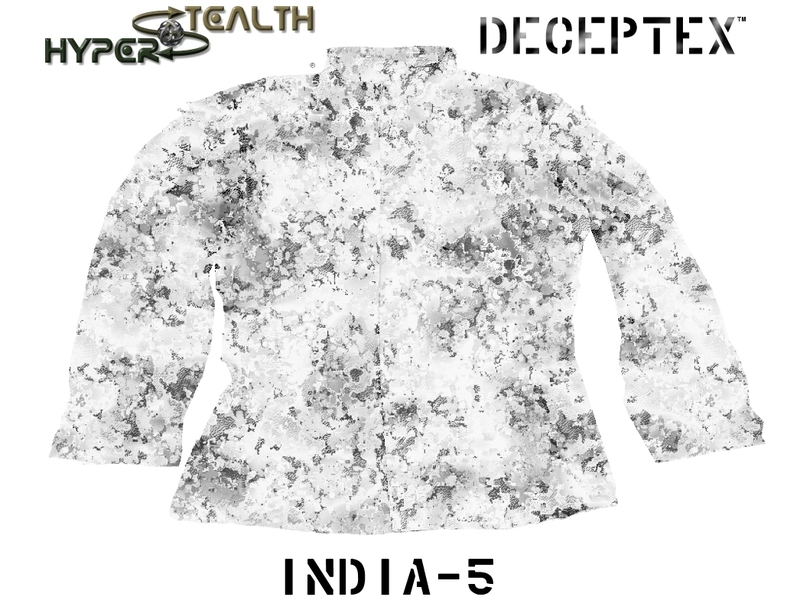 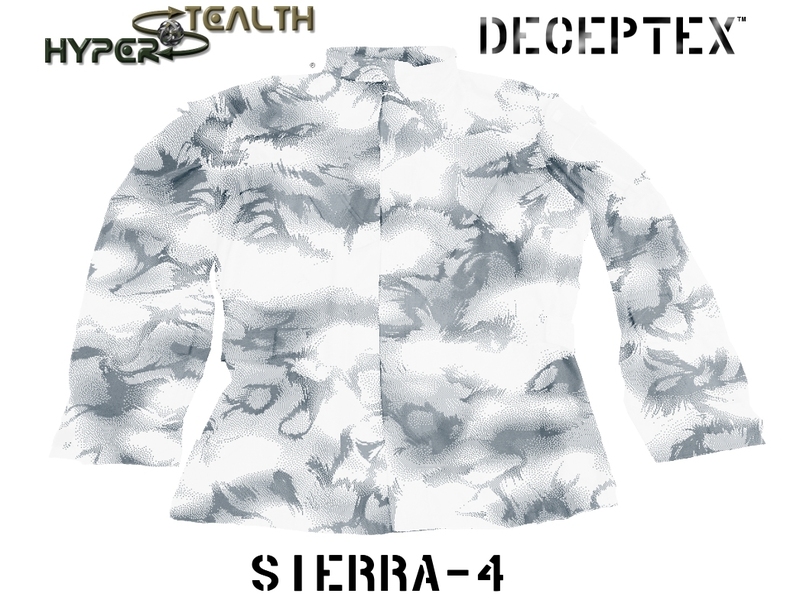 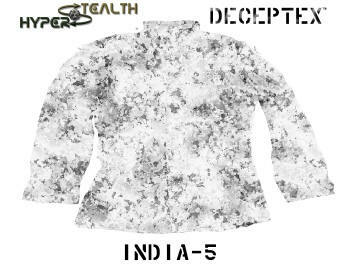 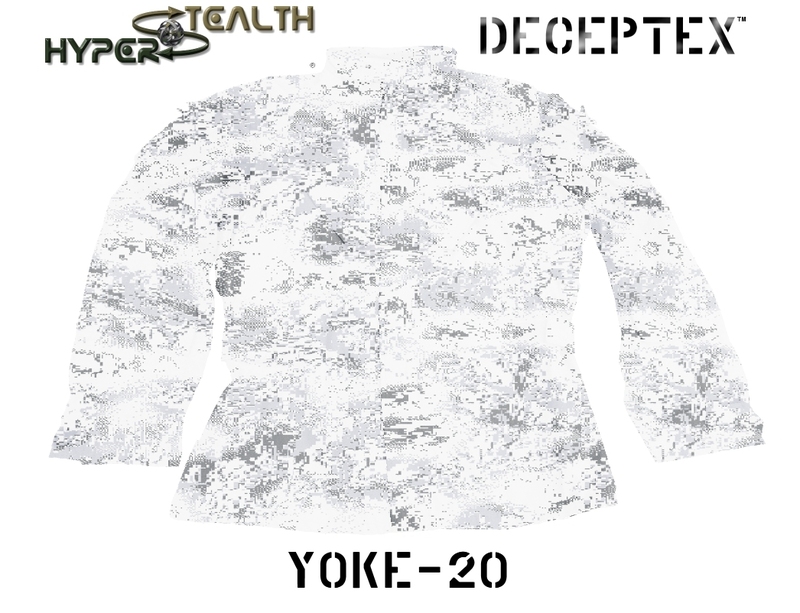 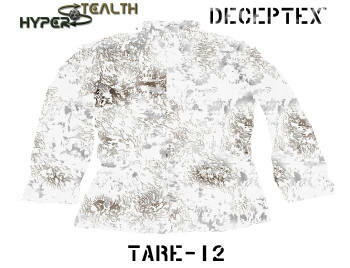 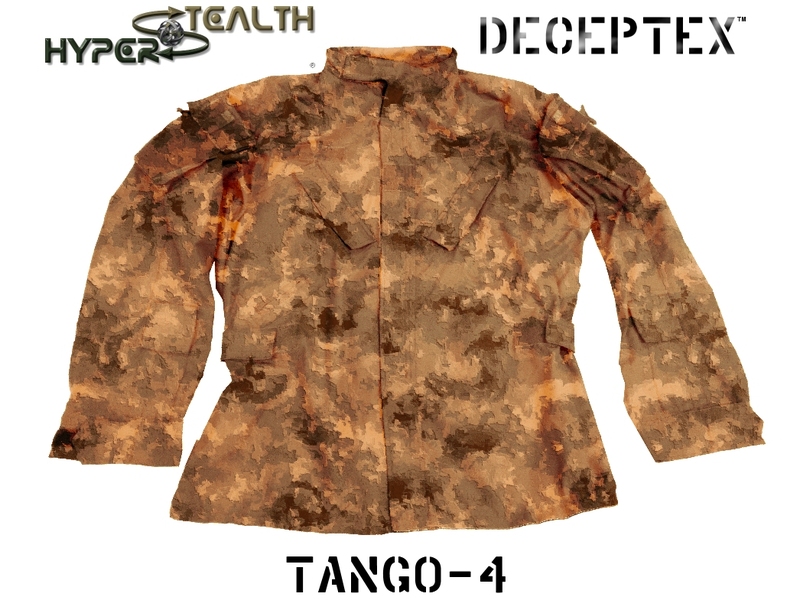 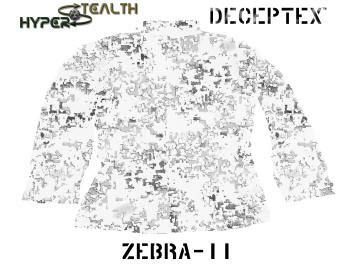 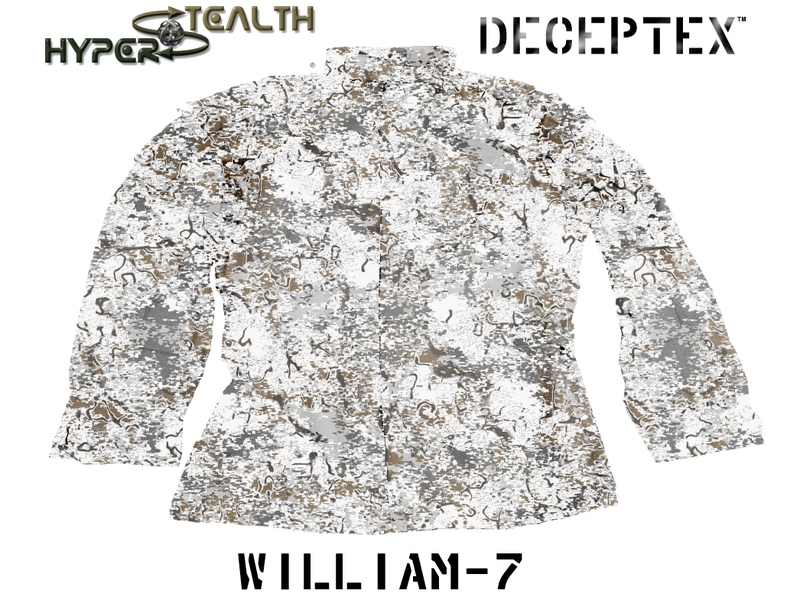 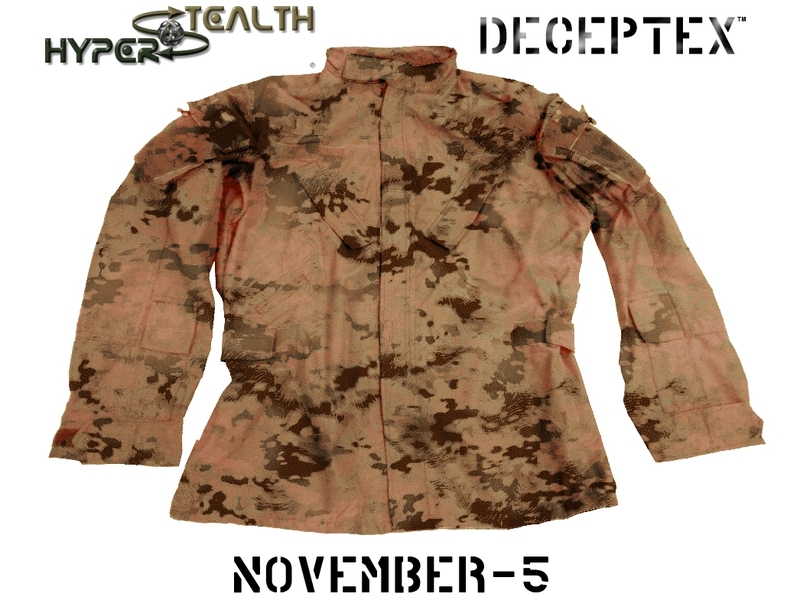 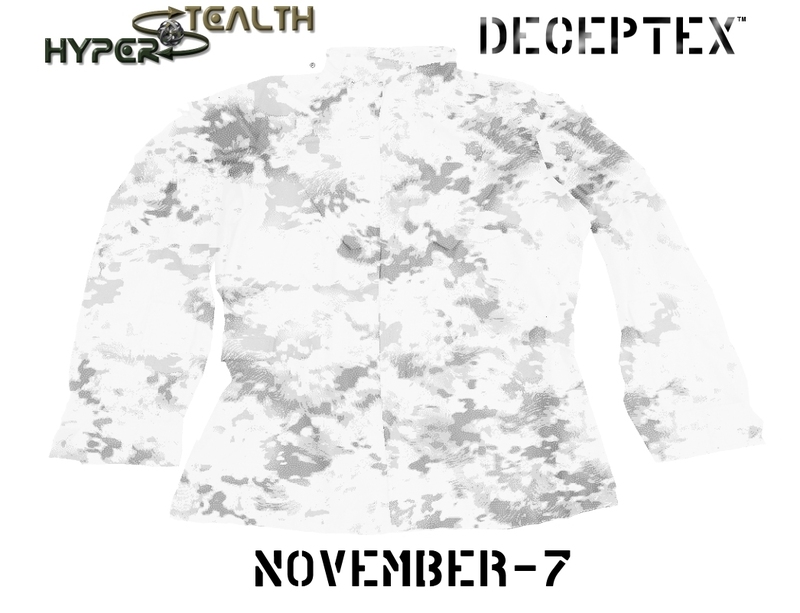 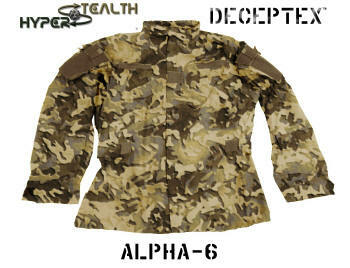 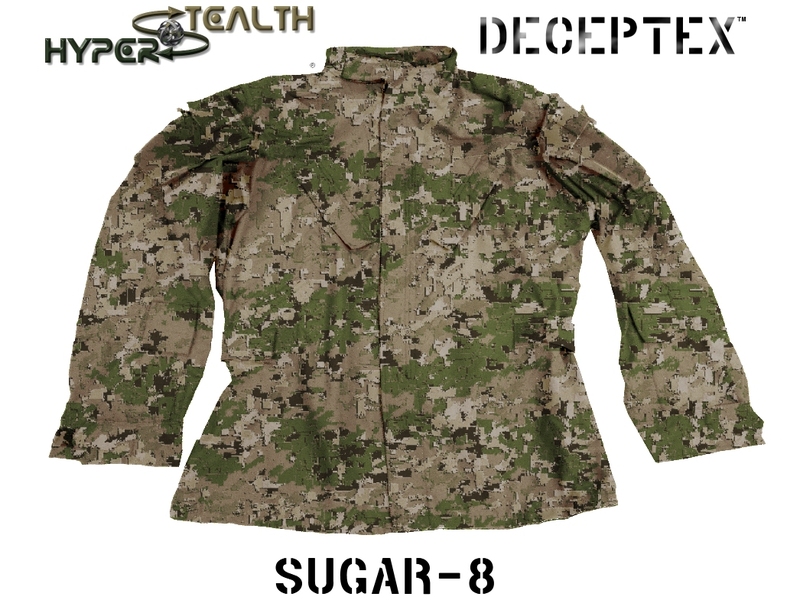 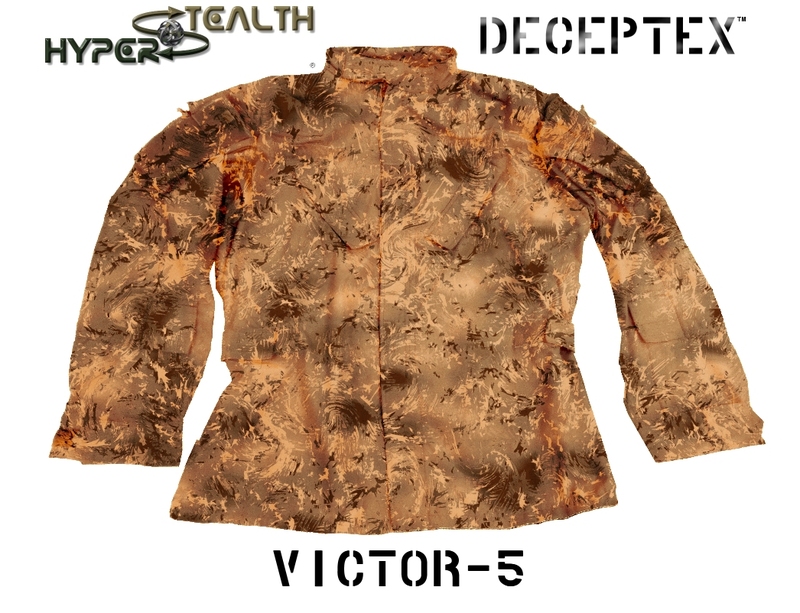 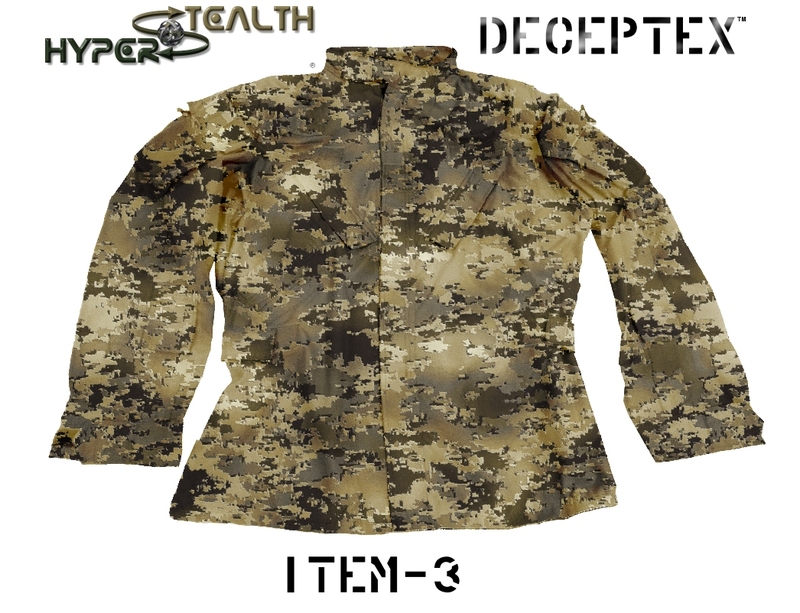 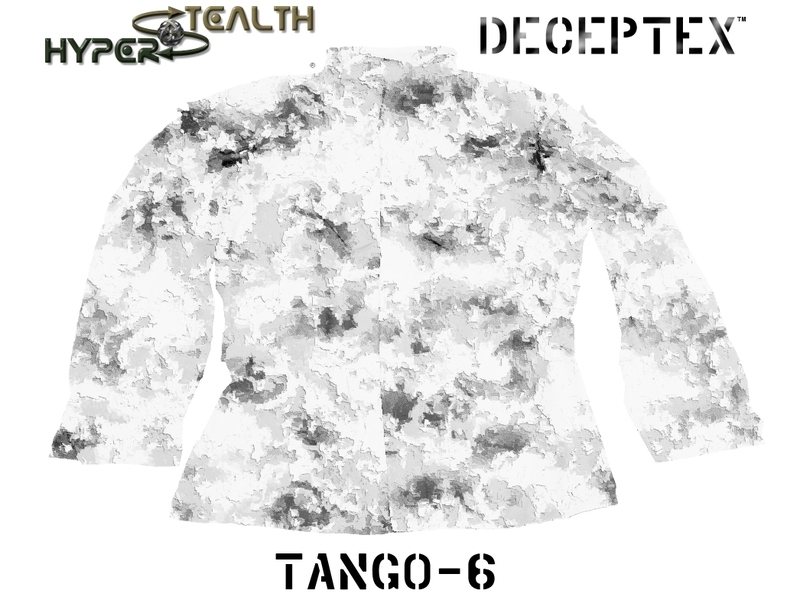 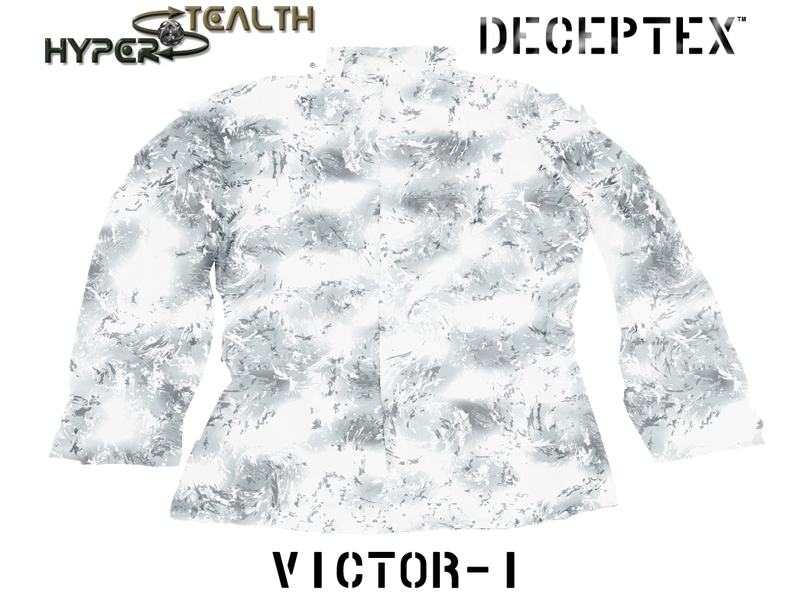 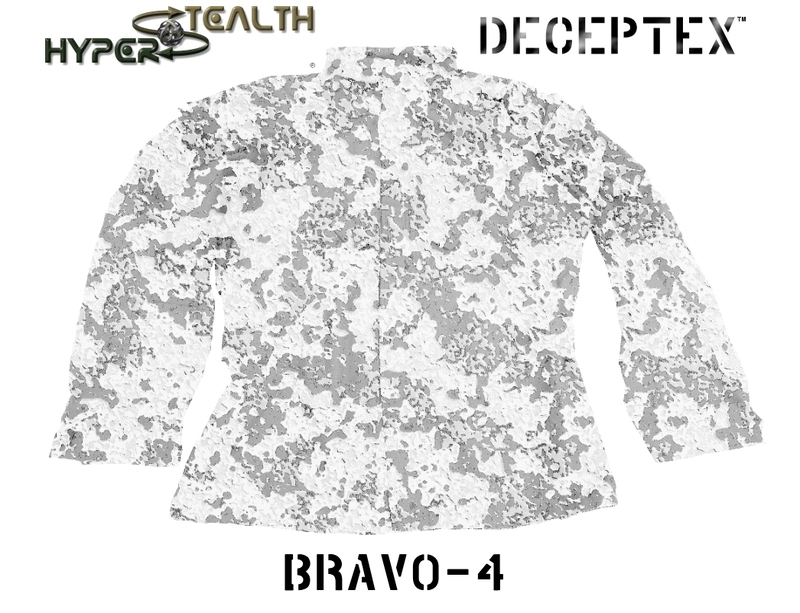 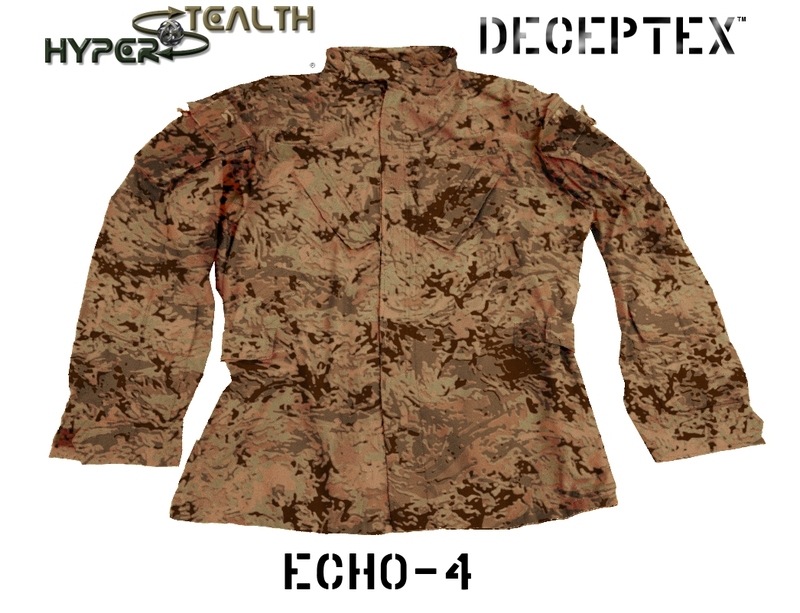 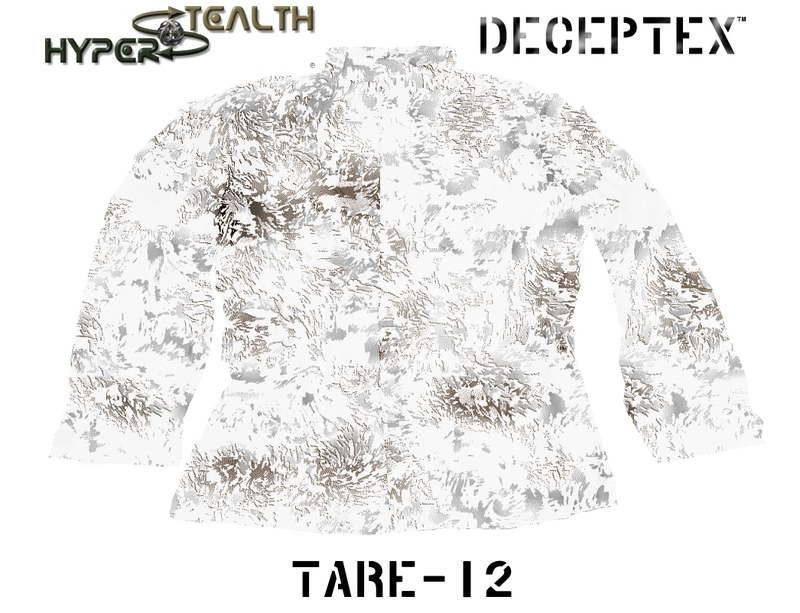 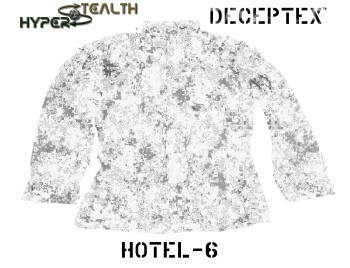 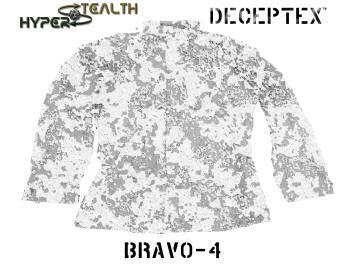 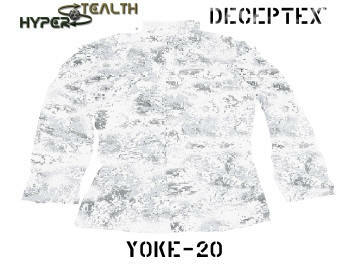 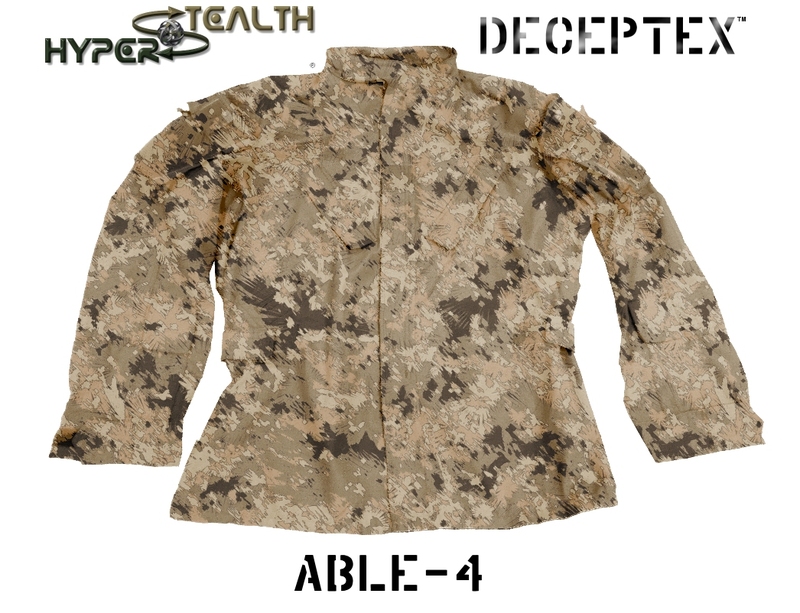 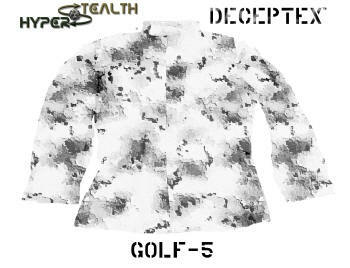 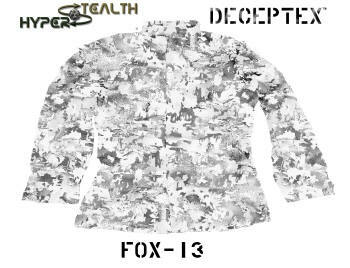 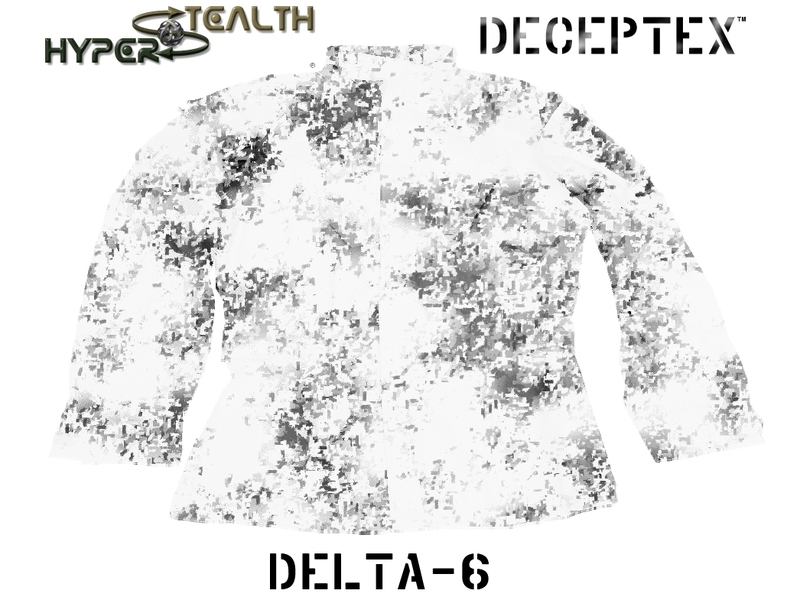 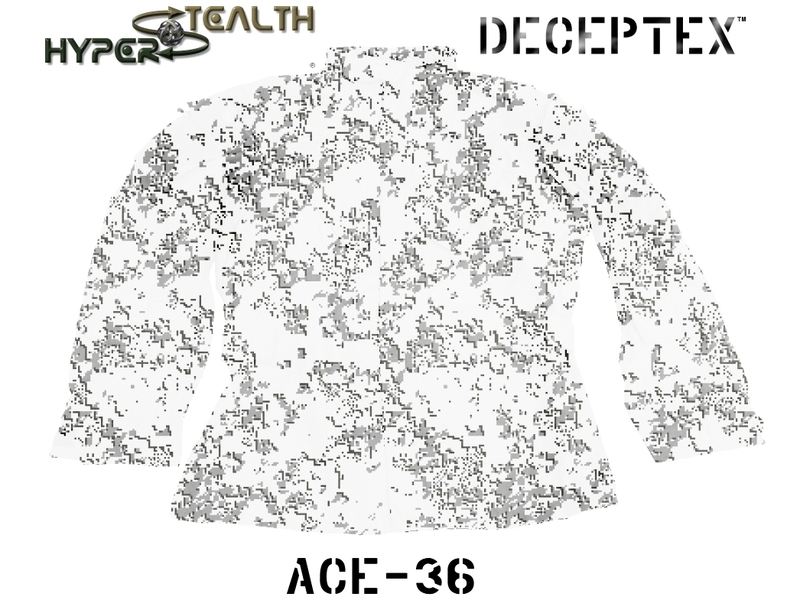 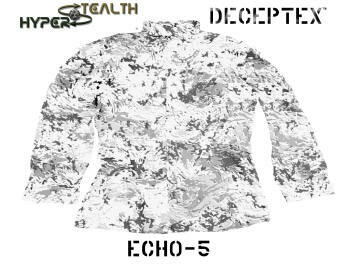 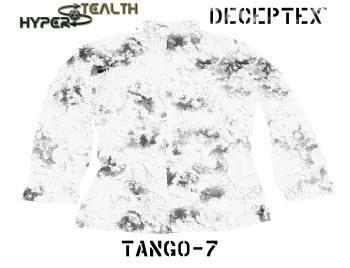 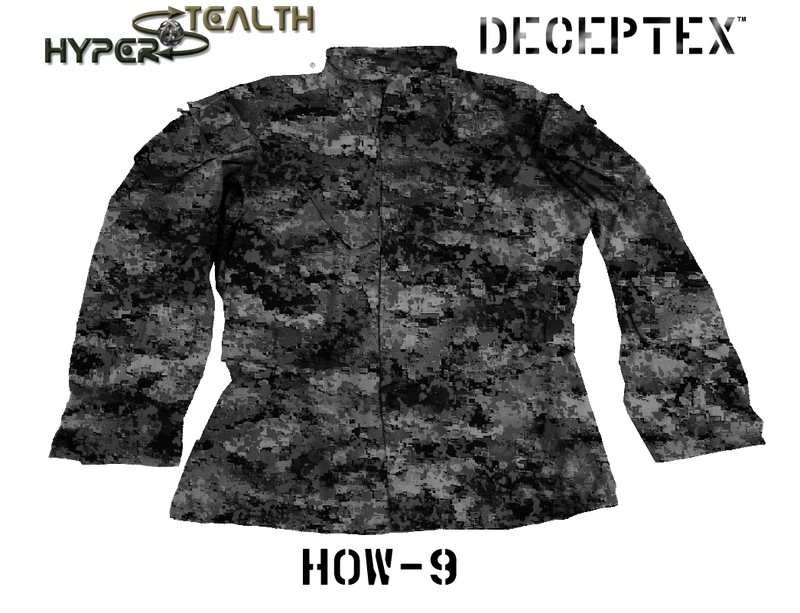 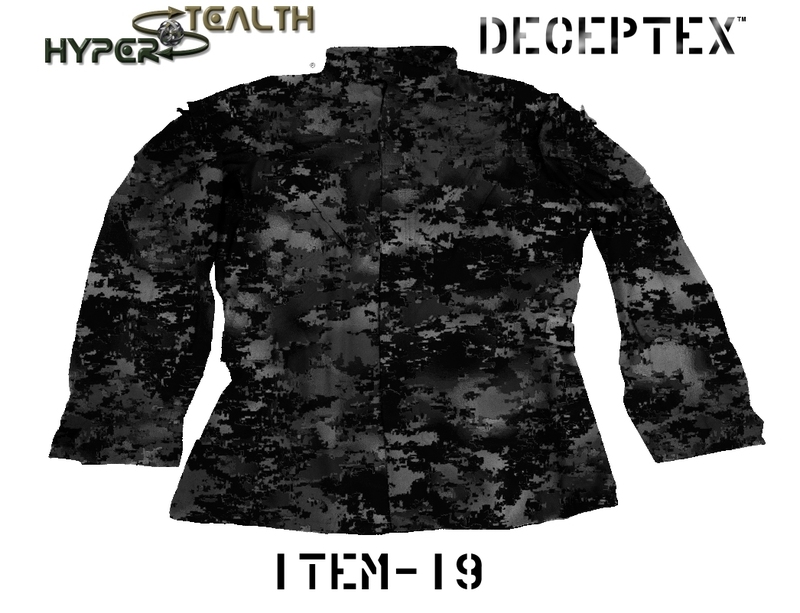 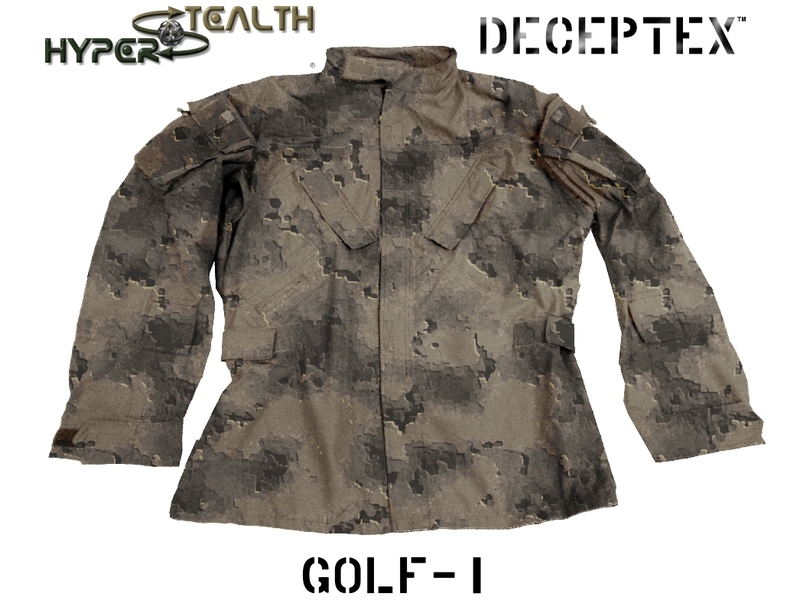 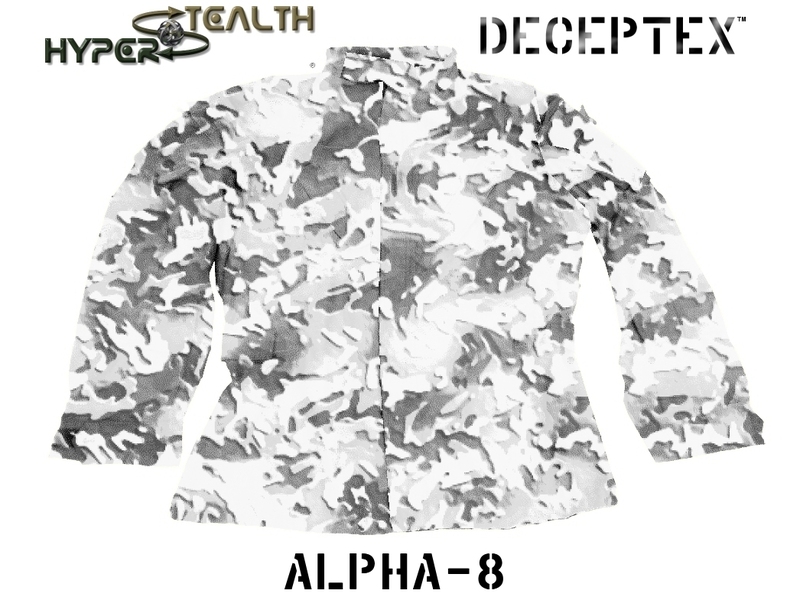 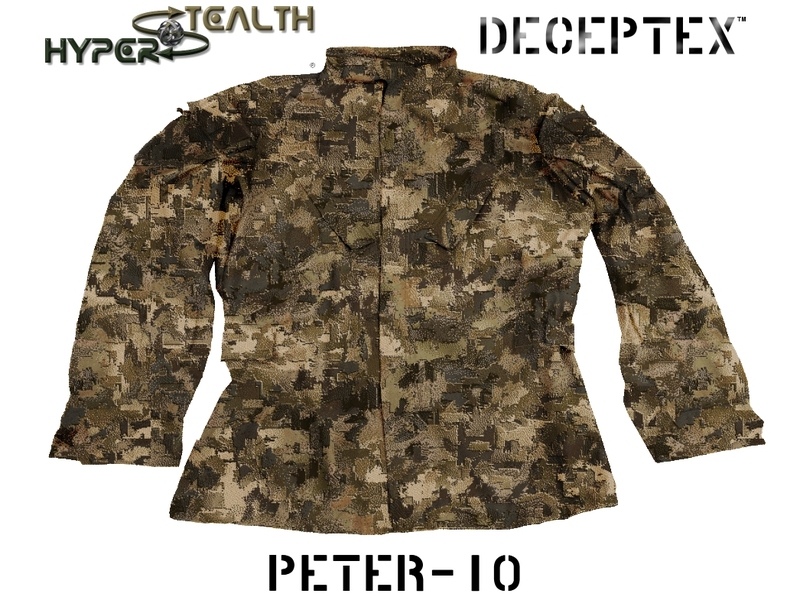 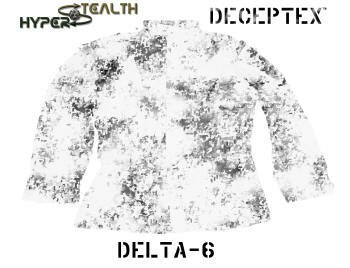 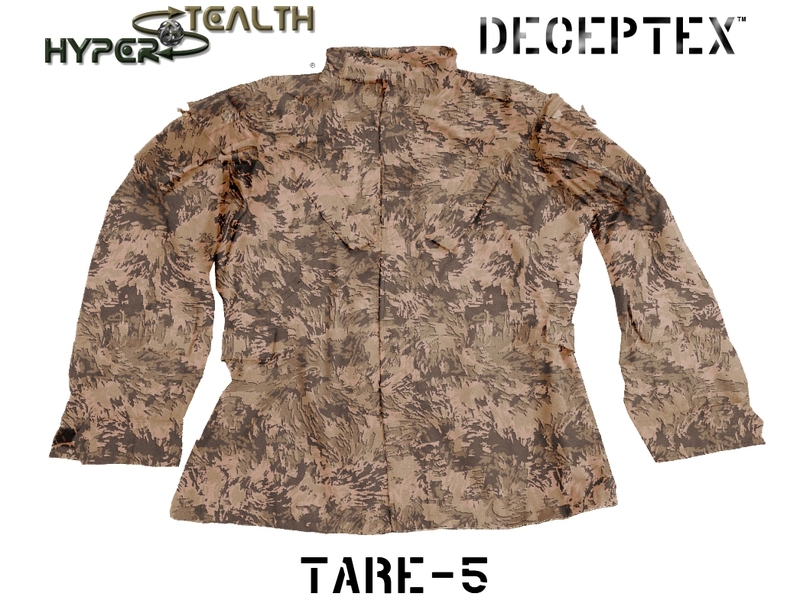 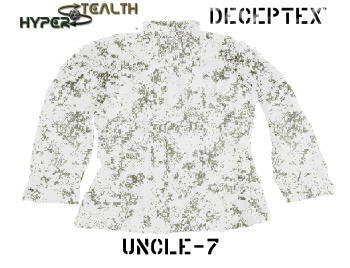 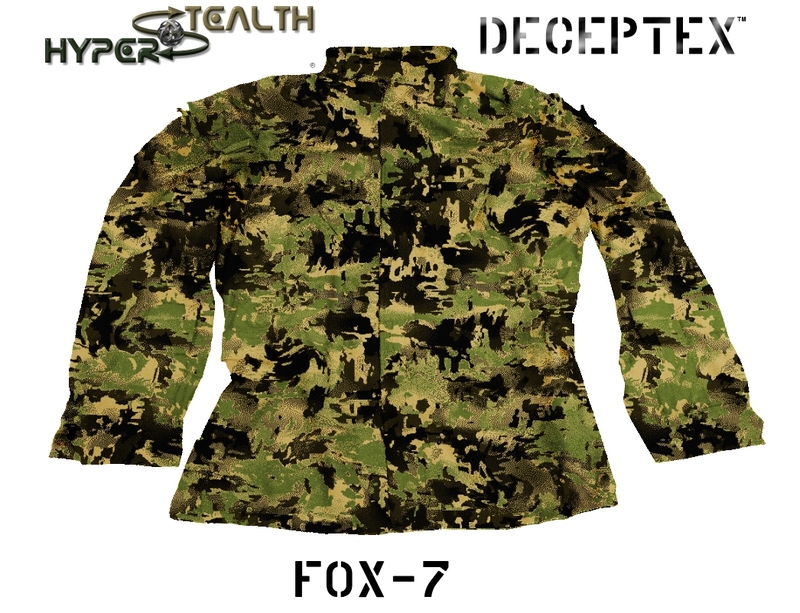 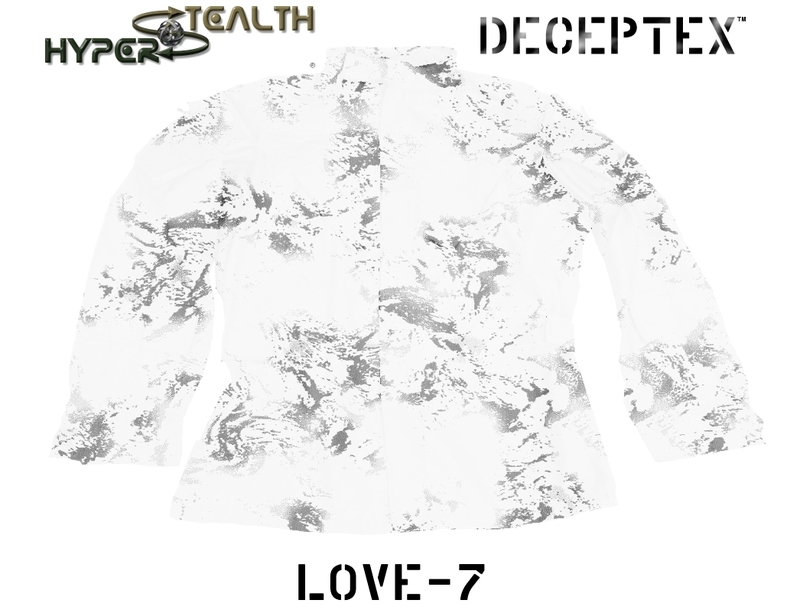 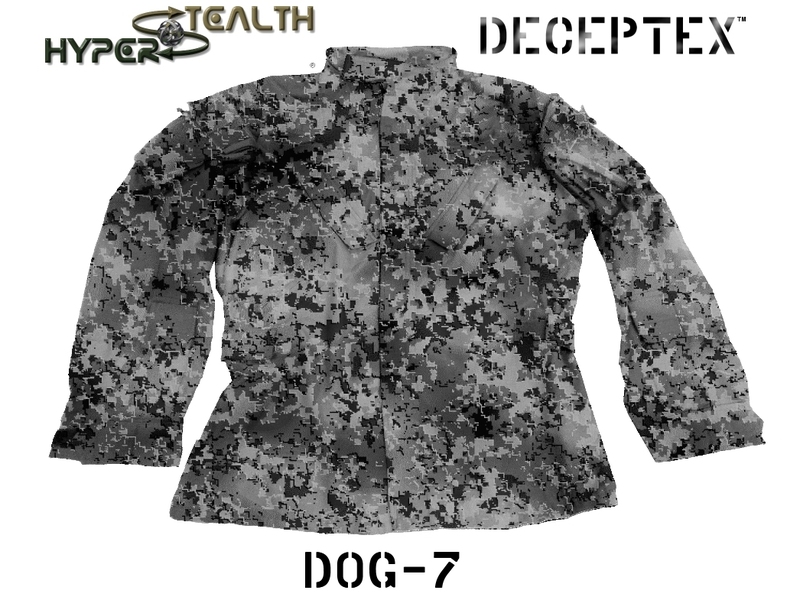 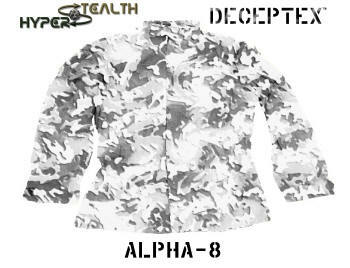 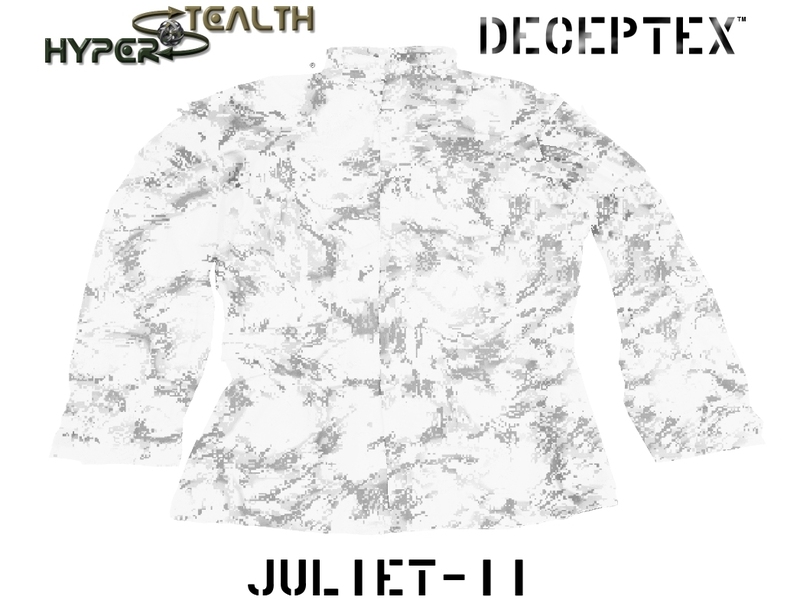 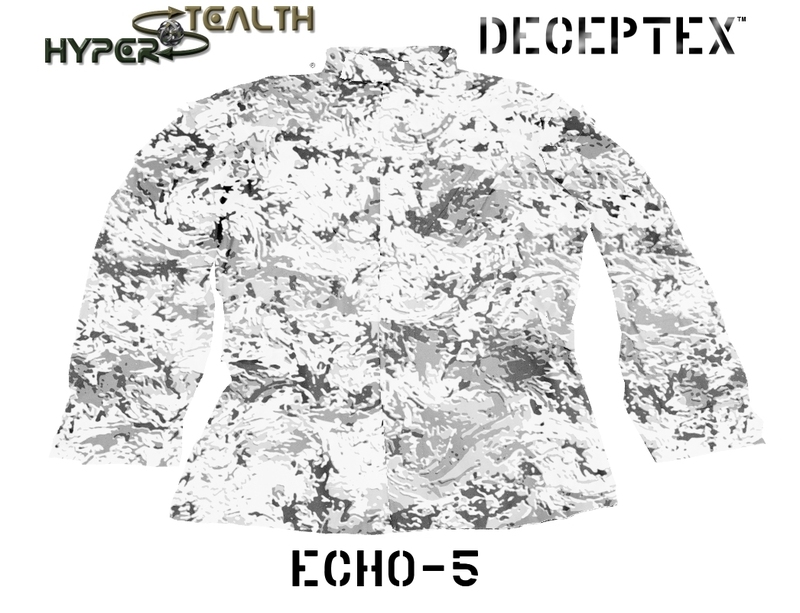 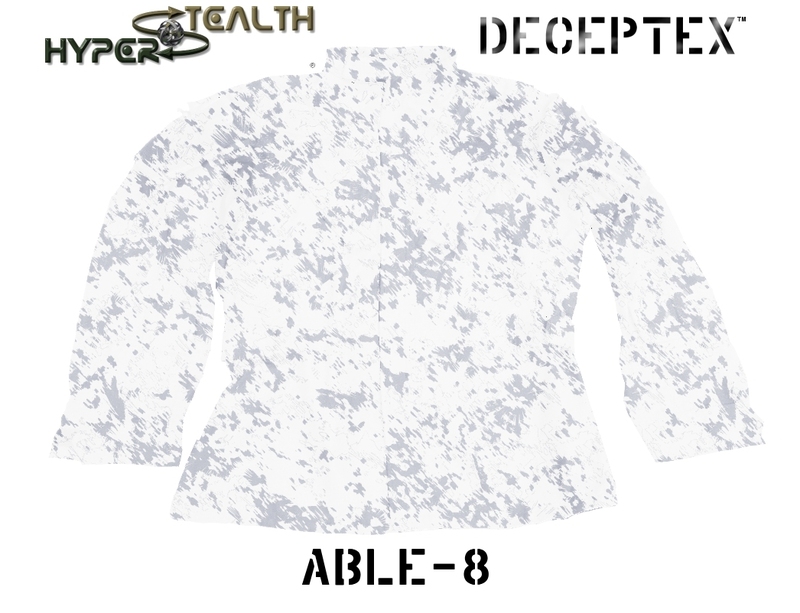 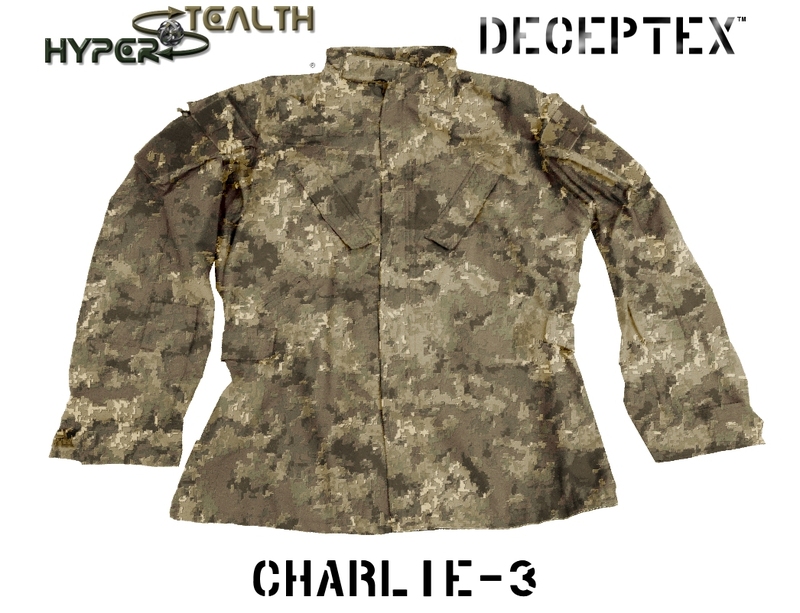 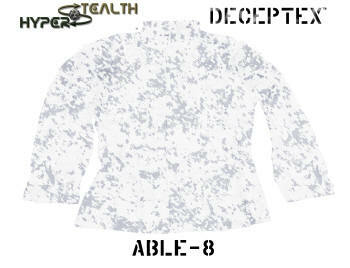 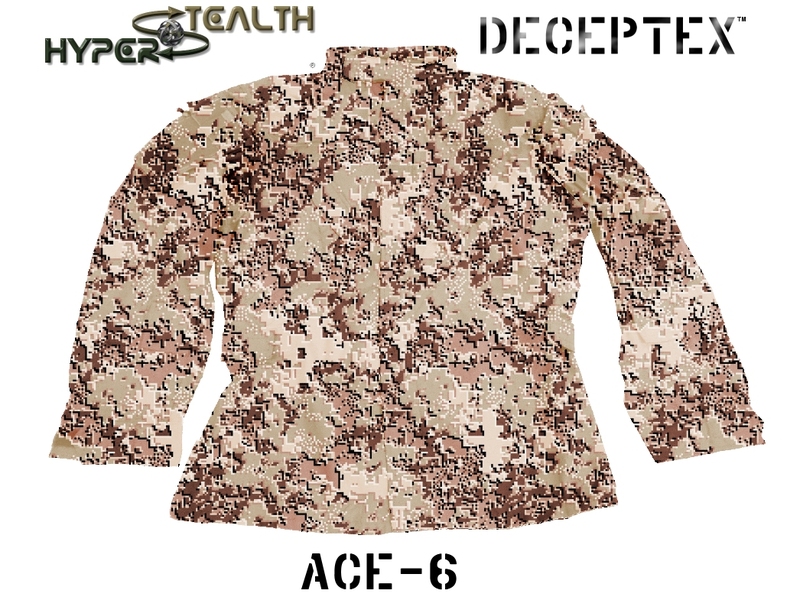 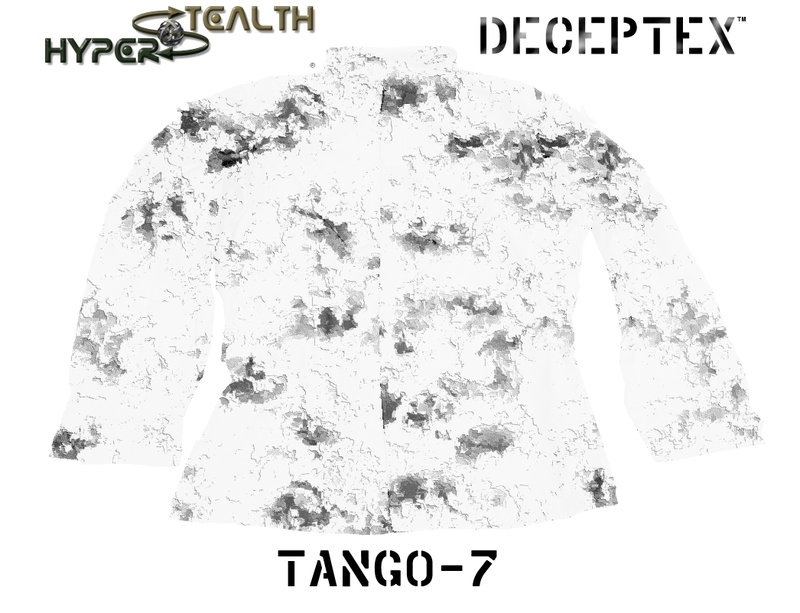 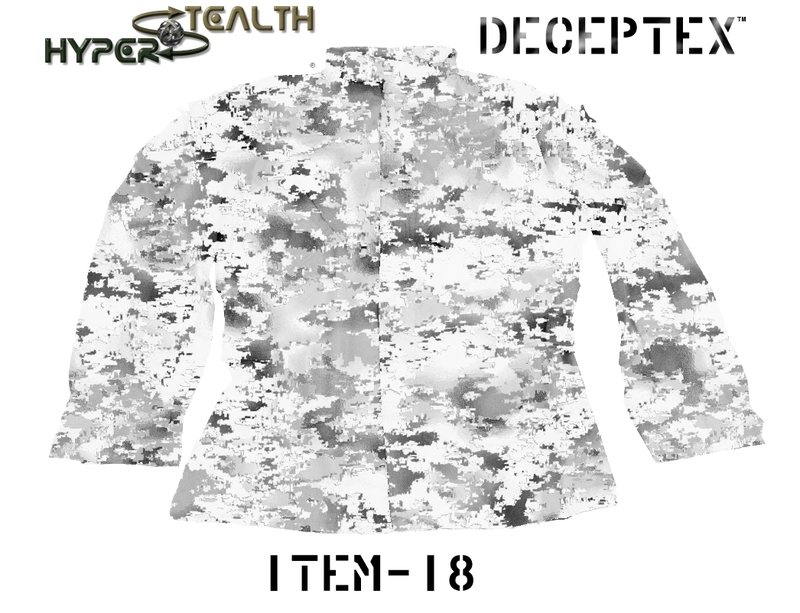 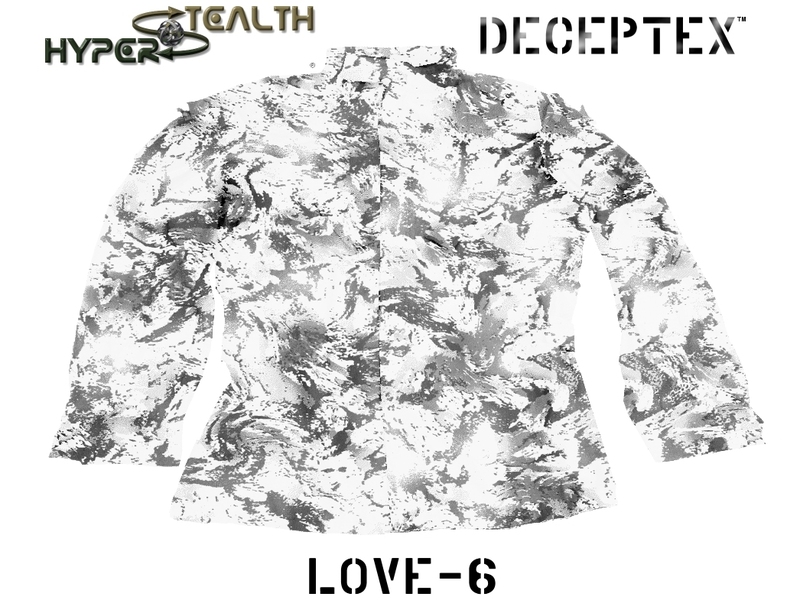 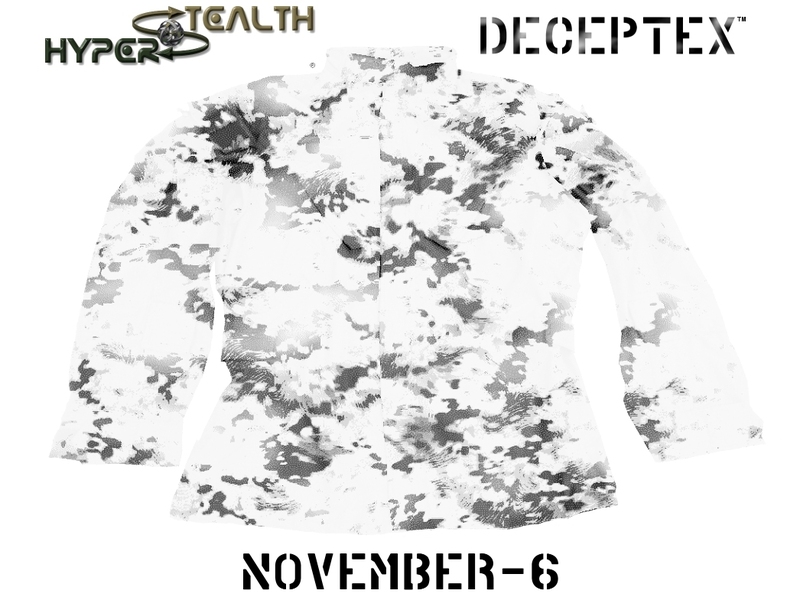 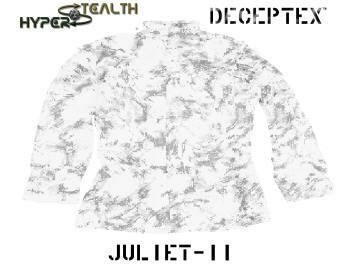 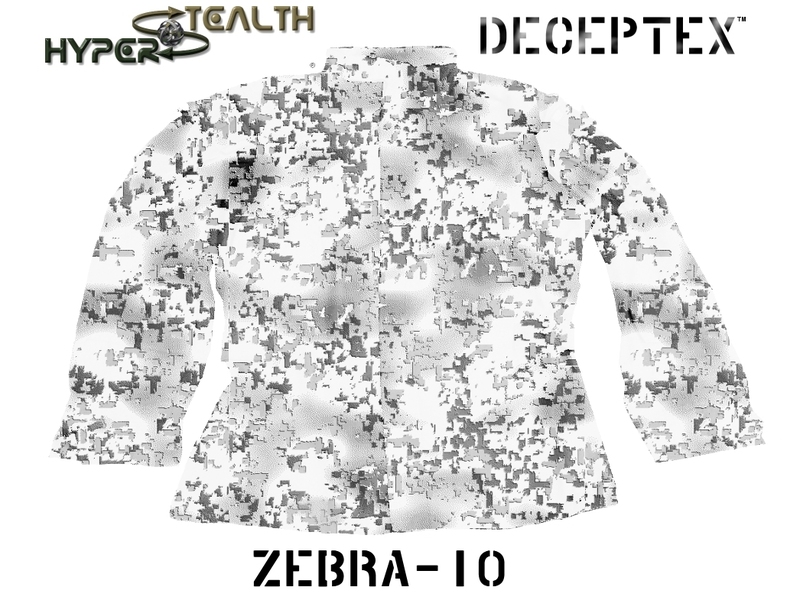 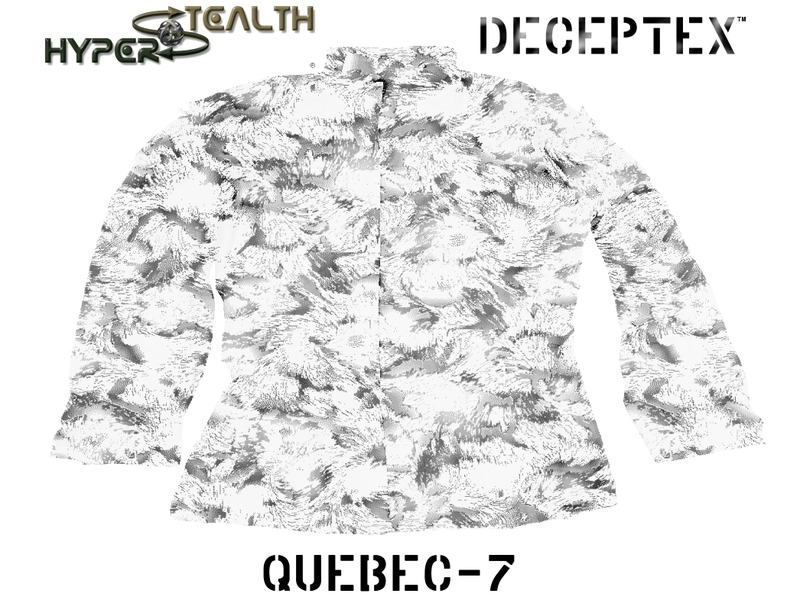 With Deceptex, Hyperstealth now only needs to have blank textile rolls and ink in stock, when the customer orders Pattern "Alpha-5" in a medium size pants and large size jacket, Hyperstealth prints only enough material of Pattern "Alpha-5" for a pair of pants and one jacket and assembles the uniform to the size that was ordered. 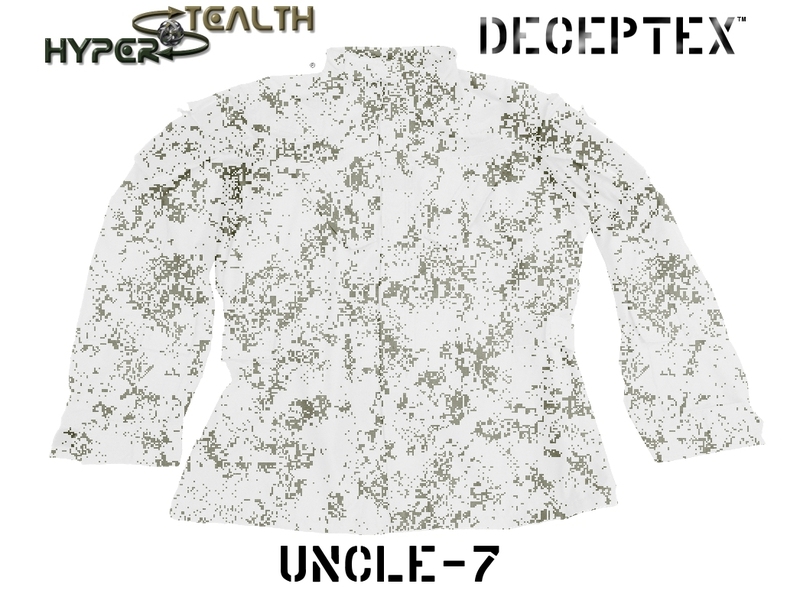 No longer do they need to have any inventory of every pattern and every size. What's the difference between Ghostex and Deceptex other than pattern selection? 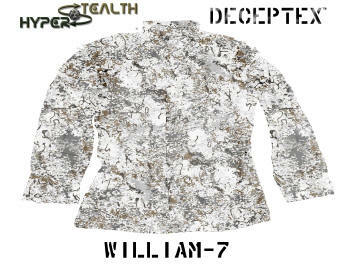 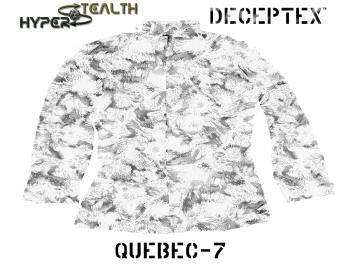 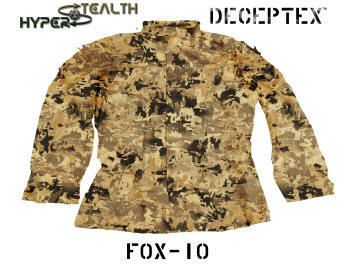 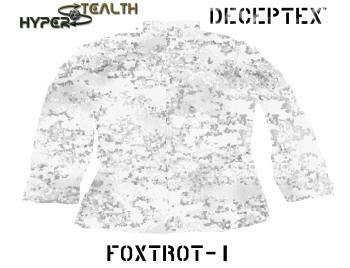 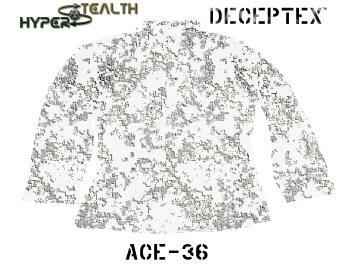 Deceptex patterns will be available for purchase by the general public. 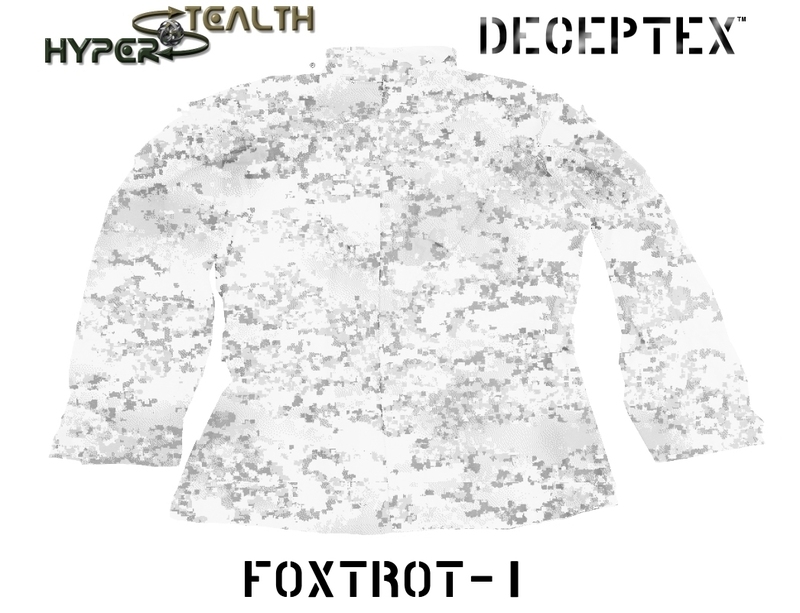 Ghostex patterns are only available to the U.S. Special Forces and use inks that also camouflage in the NIR (Near Infrared - Night Vision) spectrum. Deceptex uses non-Infrared inks (Deceptex patterns will not work under night vision cameras, scopes or sensors). Cramer has developed over 12,000 camouflage patterns and plans to have at least a few hundred patterns available to order under the Deceptex system. The photo to the right shows 80 different master copies of Hyperstealth patterns run over just the past 5 weeks. 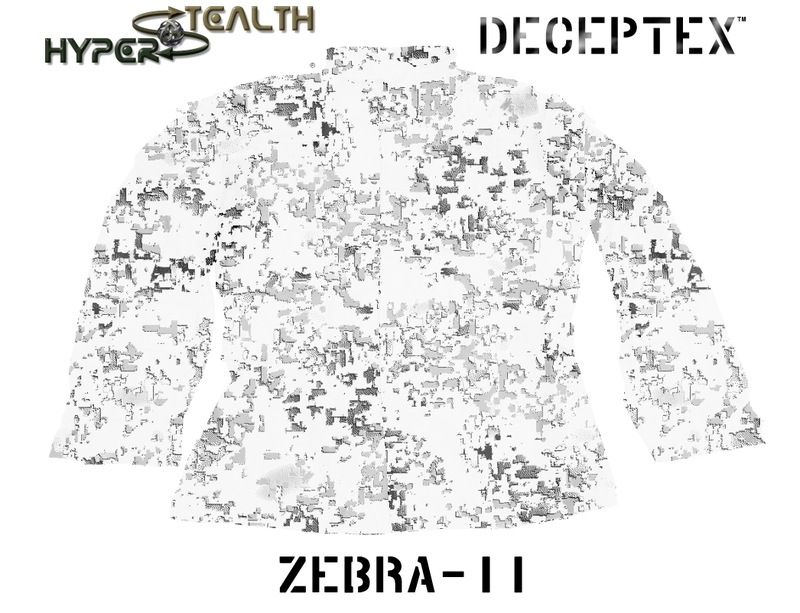 The company keeps a master color copy of every textile pattern printed for reference. Below are simulated Deceptex patterns which will be available to order (more will be added as time permits). The style of jacket is subject to change (it is used as a customer reference to color and scale of pattern to choose from). Deceptex fabric orders will also be produced at that same time (No pre-orders). What material will Deceptex initially be available in? We worked with a leading Canadian Textile manufacturer who provided their top six recommended fabrics for Deceptex. Our primarily concerns being durability, color retention and comfort; we printed on each and washed them all to see which would hold the colors the best after repeated launderings. 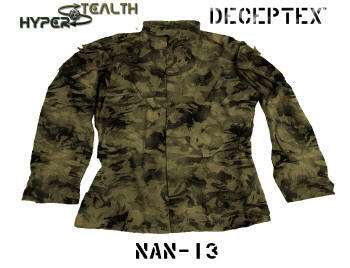 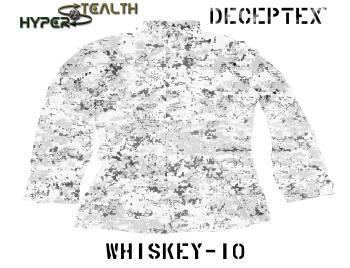 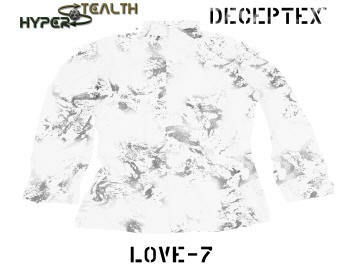 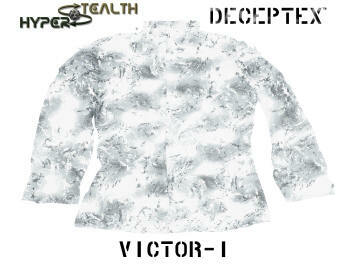 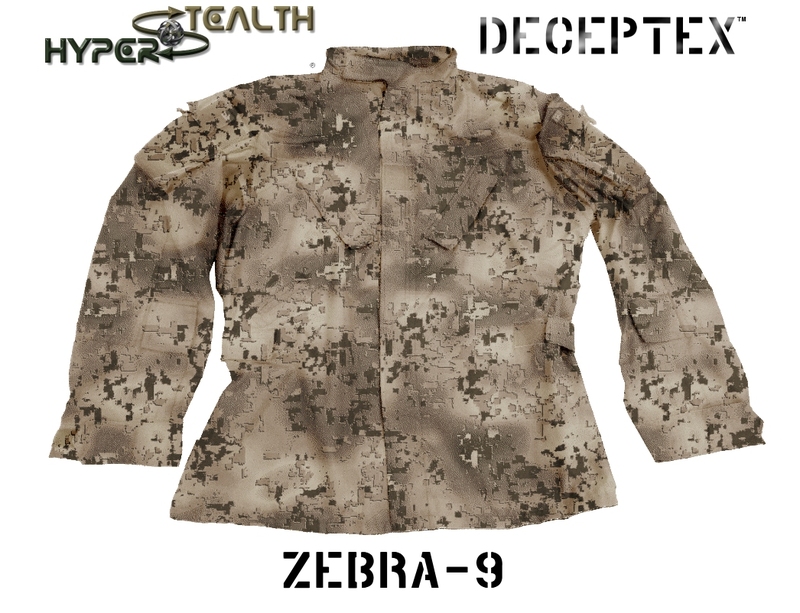 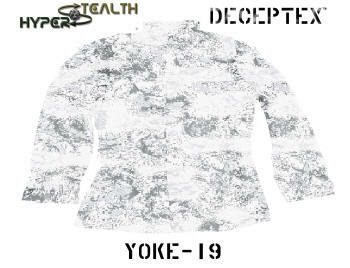 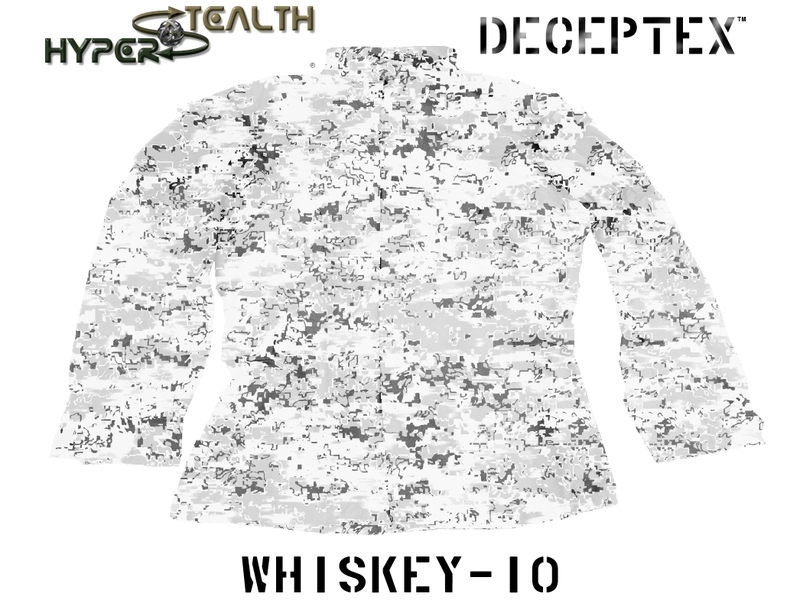 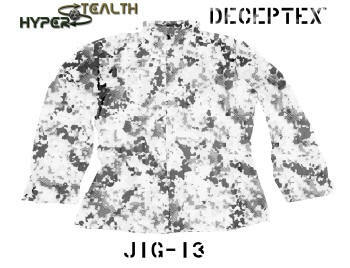 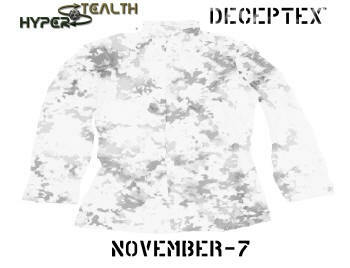 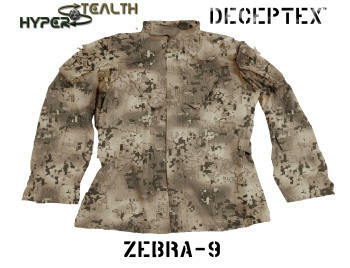 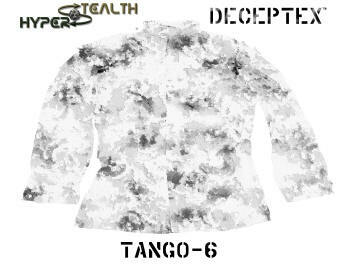 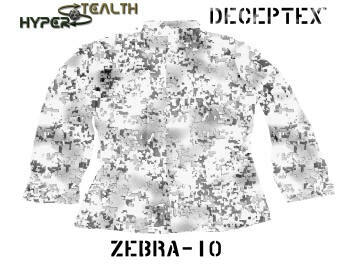 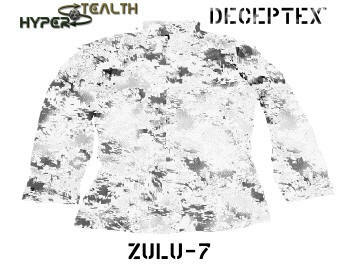 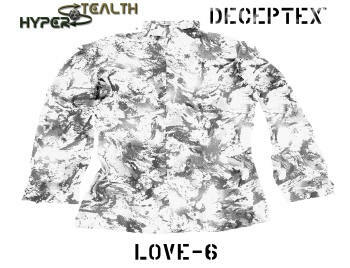 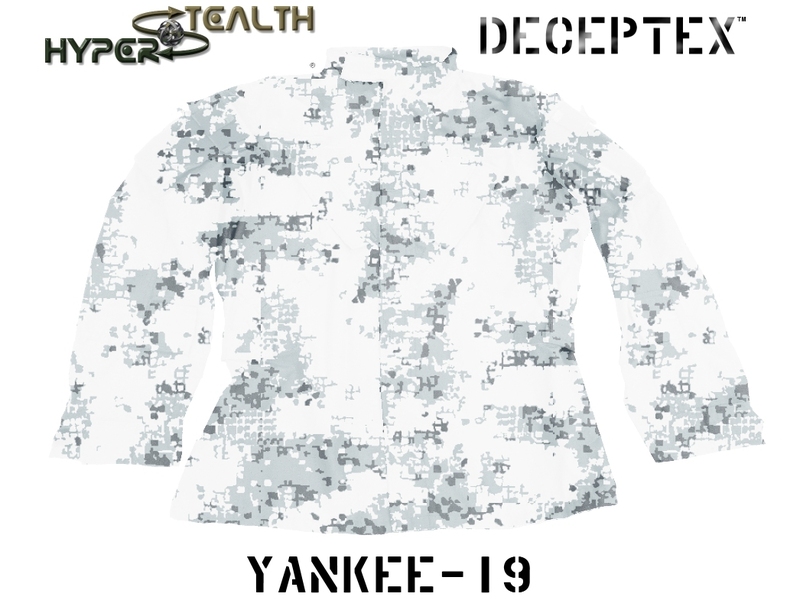 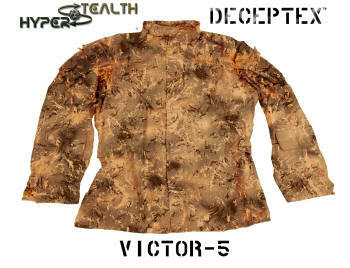 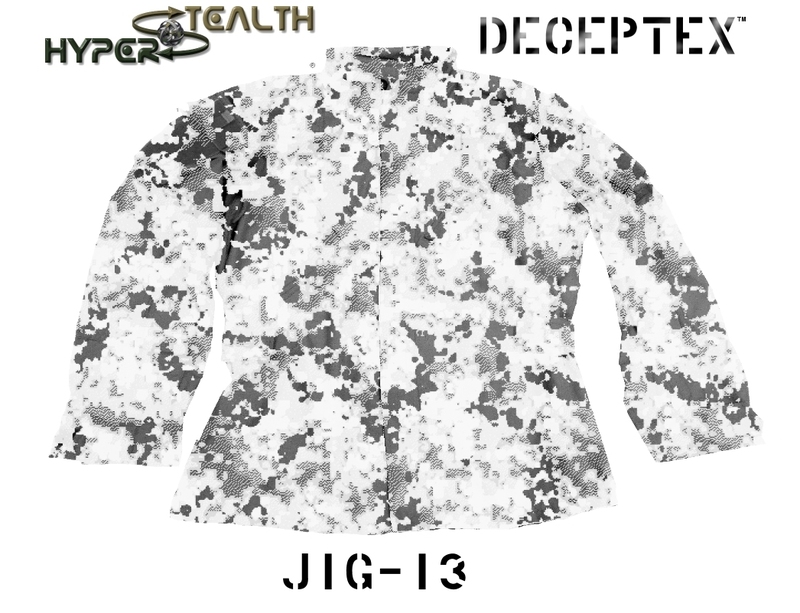 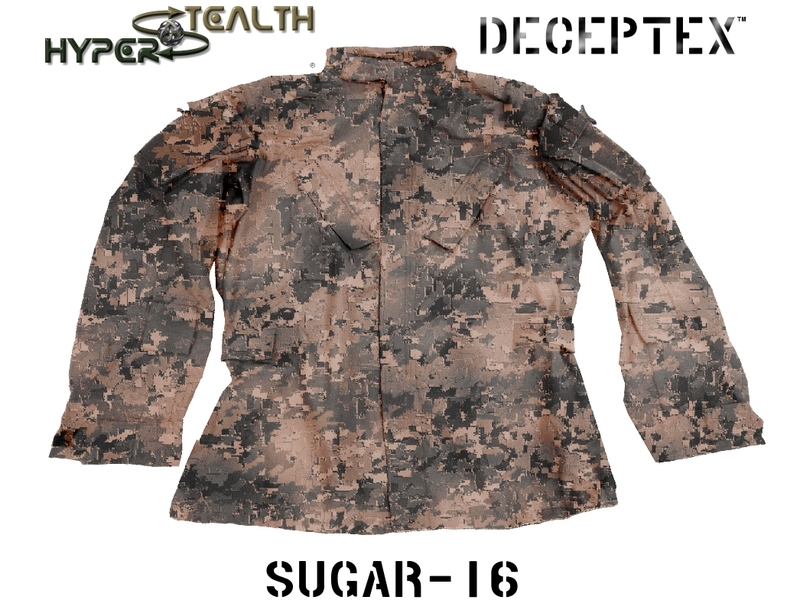 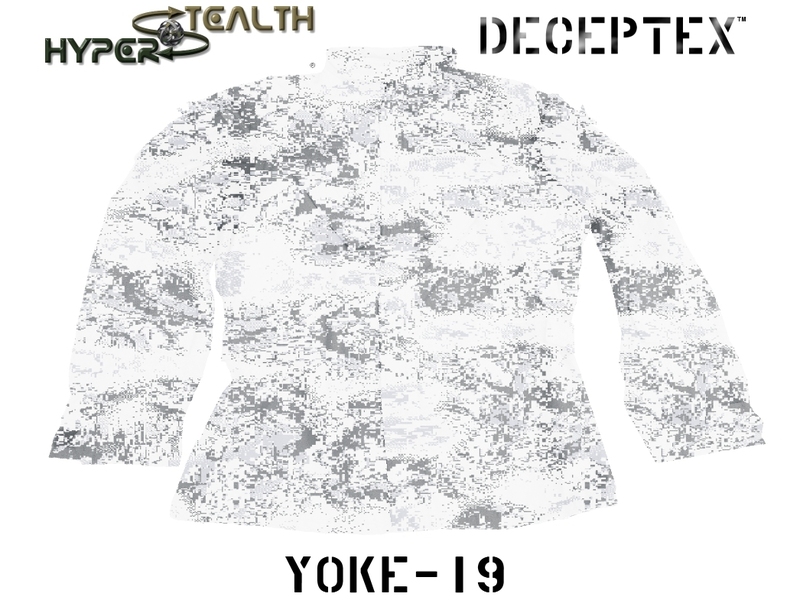 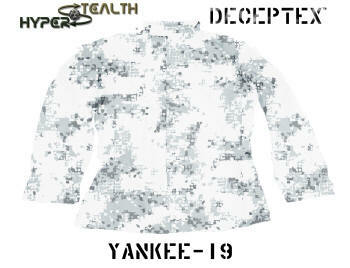 Hyperstealth settled on a light weight (6.50 oz./yd2, 70/30 Polyester/Cotton Twill with 15%-18% woven-in stretch. This is material is also being used for uniforms being used by Canadian tactical teams so we knew that it would work for Deceptex. All prices are in Canadian funds . We add an additional 18% for shipping. As of January 9, 2015 $1.00 CAD (Canadian) = 0.8422 USD (1 USD = 1.1873 CAD) see www.xe.com for up to date conversions of most major currencies. Canadian Residents will be charged GST or HST depending on your Province or Territory. Click on any simulated jacket to see a larger version (this will help you visualize scale and color of each pattern). 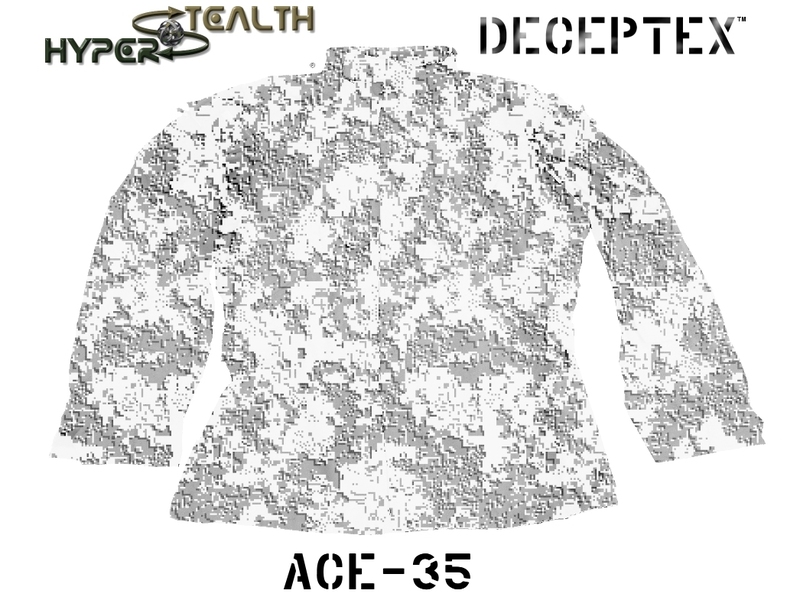 IWe have temporarily suspended the ordering from this page to allow us to complete our patents on the Quantum Stealth Light Bending Material. We will reinstate the ordering ability on this page after we have completed our patents. 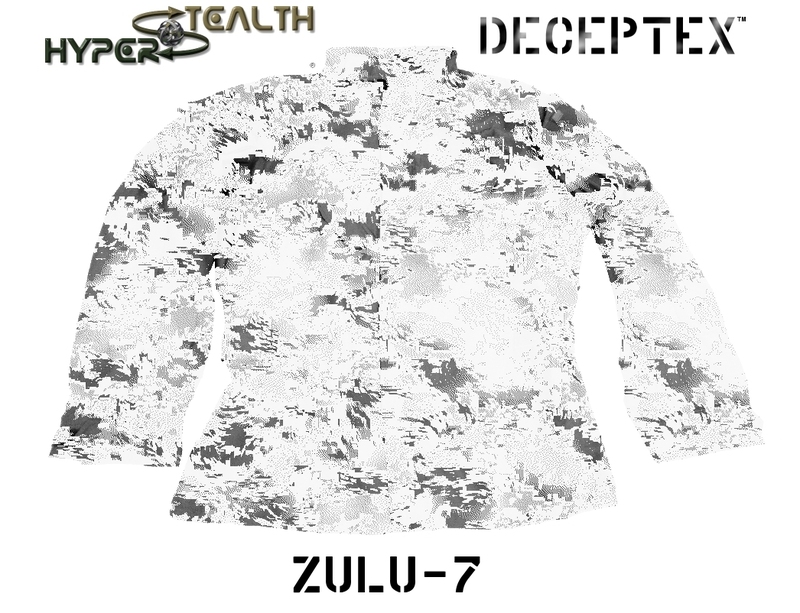 These patterns are copyright © 2004-2013 by Guy Cramer, All Rights Reserved. 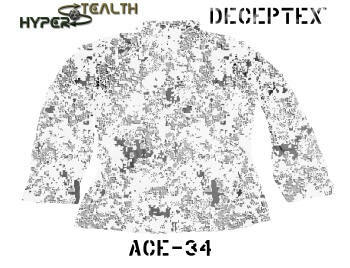 Patterns may only be used only with permission. This page and information © Copyright 2013, Guy Cramer, All Rights Reserved. 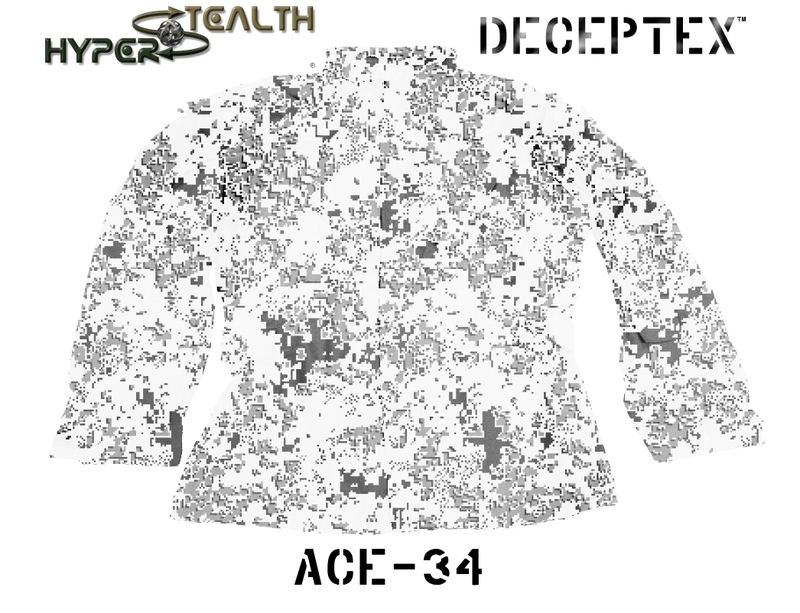 Deceptex, Ghostex, Spec4ce and Act Natural are Trademarks of HyperStealth Biotechnology Corp.